Dhaka, July 2 (Just News) : The Bangladesh Nationalist Party (BNP) has announced demonstration programmes in protest against the “government role” in a Supreme Court decision regarding the bail petition by its imprisoned chairperson Khaleda Zia. The programmes include public rallies across the country on 5 July and token hunger strikes on 9 July. 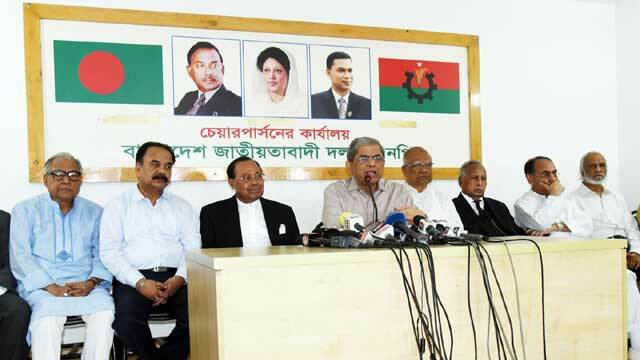 At a press conference at the party chairperson’s Gulshan office on Monday evening, BNP secretary general Mirza Fakhrul Islam Alamgir announced the programmes. Fakhrul said his party would hold a public rally in front of the party’s Naya Paltan central office in Dhaka on 5 July and the party’s district units would hold such rallies in their respective districts at their convenient time and place the same day. He said the party would seek permission for holding its token hunger strike either at Engineers’ Institution, Bangladesh or at the Dhaka Mahanagar Natyamancha in the capital. The BNP’s other senior leaders were also present at the press conference.